While visiting our local public library recently, I encountered a small exhibit of books about creativity. Obviously that caught my attention. Among typical ‘suspects’ like Creativity: The Psychology of Discovery and Invention from Mihaly Csikszentmihalyi, Creativity, Inc.: Overcoming the Unseen Forces That Stand in the Way of True Inspiration from Ed Catmull and Amy Wallace, Big Magic: Creative Living Beyond Fear from Elizabeth Gilbert, and Steal Like an Artist: 10 Things Nobody Told You About Being Creative from Austin Kleon, there was a book I didn’t recognize – Let the Elephants Run: Unlock Your Creativity and Change Everything by David Usher. My attention grabbed an effort of its creators to stress creativity by the visual design of the book as well. While browsing through the pages I realized that the name David Usher was completely unbeknown to me. Somehow he escaped my attention probably due to the similar name with another musician Usher, whose music is not ‘my cup of tea’. 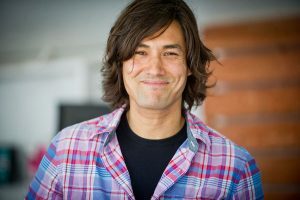 And another surprise was that David Usher is also a fellow Canadian. So I took the book with me home and after a brief Internet research decided to try out some of David’s songs. By a fortunate stroke of serendipity the first song I found on YouTube was the Black Black Heart. And I was hooked. If he produces songs like this, I definitely wanted to know what he has to say about creativity. The book didn’t disappoint. It is an honest view on creativity and the creative process from someone, who has the experience and lives it every day. Who uses his creativity not only as a successful musician, but also as a writer, speaker, entrepreneur, and activist. It also shows that the author did his research on the topic and knows what he is writing about. The first of two parts of the book focuses on the creativity itself and the author calls it the Freedom. What makes this attractive is his personal touch. Everything is easily believable as it is viewed and described through the eyes of an experienced practitioner. A professional musician. These are also interesting illustrations of the world of music for someone who wants to know more and understand it better. But the author makes sure that his book is not only about music. It is more universal when writing about creativity in general. A very helpful parts of the book are the nineteen ‘Actions’. They are grey pages offering a reader to participate and write his or her own views or creative exercises. Each one relates to a particular part or the book and could become a spark or ‘a starting point’ for someone who doesn’t know where or how to start in a creative process. The second part of the book, called the Structure, helps to learn how to use creativity in a creative process. Because as he put it ‘Execution IS Everything’. I like the depiction of the Dream versus the Reality of the artist’s life. To anyone thinking about a career in a creative/artistic field it must be clear, that although it looks like a lot of fun, first and the foremost it is a lot of hard work. Let the Elephant Run is a playful book. Its visual appeal supports and augments the content, therefore different types of learners can enjoy it. 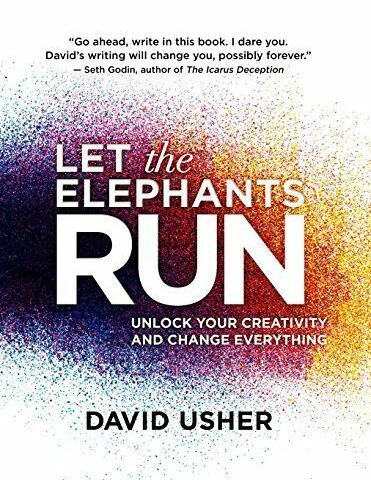 If creativity is something you would like to know more about, or if you have that ‘itch’ to start something creative, David Usher’s book could be a good starting point.